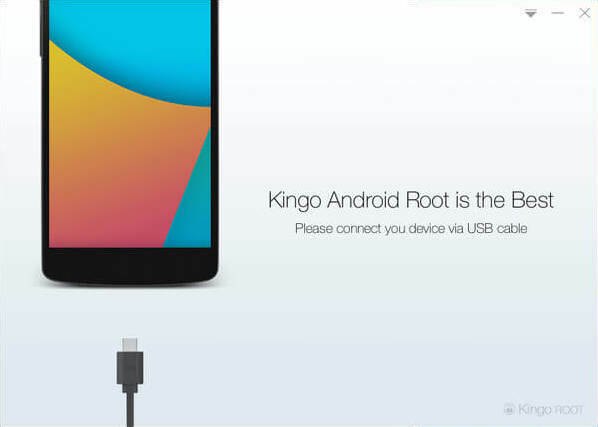 Remove-root function is built in KingoRoot Android (PC version), which is a considerable decision made my Kingo R&D team when programming the software. It offers users a choice to revert back to unroot status by one-click, fast and simple. 1. If you have rooted your Android device with KingoRoot Android(PC version), you must be quite familiar with the preparation part and steps. You can go directly to the remove-root part and see how it goes. 2. If this is the first time for you to use KingoRoot Android(PC version), you are recommended to follow the guide step by step in case that everything is done right. 1. Free download KingoRoot Android(PC version) and install it on your computer. 2. Make sure your device is powered ON. 3. At least 50% battery level. 4. USB Cable (the original one recommended). 5. Enable USB Debugging on your device. Step 1: Find the desktop icon of KingoRoot Android(PC version) and double-click to launch it. Step 2: Connect your device to your computer via USB cable. If it is the first time to connect, you may have to install device driver software. It should be done automatically. After successfully installing device driver software and enabling USB Debugging mode, your device should be well connected. And the interface will be shown as below. Now you can see the ROOT status of your device. Read the notifications carefully before removing Root. Step 3: Click “Remove Root” to start when you are ready. It will normally take 3 to 5 minutes to complete. Once you started, do not move, touch, unplug USB cable, or perform any operation on your device anyhow! Step 4: Remove ROOT Succeeded! Click “Finish” to reboot your device. Now your device has been removed root successfully.